The SC HELP program has now reached the three and a half year mark and will continue to assist qualifying home owners with their mortgages until the federal program, through the US Treasury Department ends in December 2017. While the volume of applicants dropped statewide in April and May by as much as 50%, the applicants recently increased in August. Client demographics have trended more toward people who were in the mortgage lending/banking industry: loan officers (commercial and mortgage, processors, underwriters, IT supervisors, servicers, collectors, and loss mitigation specialist, and away from people who were in manufacturing, textiles, and manual labor positions. With the lay-offs from Citi Financial, Wells Fargo, Bank of America, independent lenders, and Centra, client applications have been brisk. Short Sale and Deed-in-lieu applications have also increased from 1-2 every six months to 2-3 every month. A new program recently rolled out by SC HELP is called MAP or more commonly referred to as Re-cast. With this program a large pre-determined amount of money is infused to pay down the principal balance of the loan on a qualifying borrower’s mortgage. The interest rate and year terms are kept intact. This infusion reduces the overall mortgage payment and “resets” the mortgage payment or rather brings the payment into proportion to the household income. All applicants are evaluated per underwriters for this program. Catawba COG continues to serve borrowers from Union, York, Chester and Lancaster counties. Borrowers from Fairfield and Chesterfield have also gained assistance. Although the housing market is beginning to crawl its way out of the recession, jobs have not reached pre-recession levels or income levels. Therefore, SC HELP continues to be available for the SC Homeowner who made need assistance. Wondering if you would qualify? 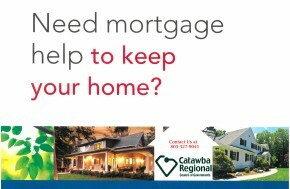 Call 803-985-9605 to talk to a SC HELP processor concerning your mortgage.